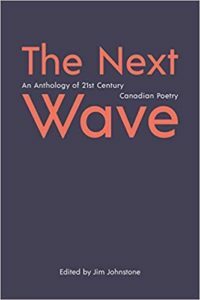 Join us to celebrate the publication of a new survey of Canadian poetry, ‘The Next Wave’. Featuring readings by Chad Campbell, James Arthur, Stephanie Warner, and the editor of the anthology, Jim Johnstone, this event will give you a taste of the best of Canadian poetry. ‘The Next Wave’ features 40 early-to-mid-career Canadian writers selected from a diverse range of national and international presses. While ‘The Next Wave’ surveys poets from across Canada, its contributors are the product of a global mindset–a distinct generation of writers characterised by the variety of their formal and aesthetic choices. Gathered into an anthology that is pertinent as well as predictive, each of the poets in THE NEXT WAVE is proof of a re-invigorated national literature. THE NEXT WAVE contains over 150 poems from writers who have published exclusively in the new century. Among the poets included are Jordan Abel, Shane Book, Mark Callanan, Dani Couture, Kayla Czaga, Jeramy Dodds, Liz Howard, Aisha Sasha John, Sonnet L’Abbe, Ben Ladouceur, Jeff Latosik, Nyla Matuk, Sachiko Murakami, Michael Prior, Damian Rogers, and Ian Williams.